(Bloomberg) -- The stock market saw nothing but red last week, and it’s been the opposite so far over the past two days. Things are looking slightly up again today (e-minis up a handle or two) with green showing up in the pre-market screens for the big tech names, with AMD, Square, and several of the FAANGs all up around a half percent, while everyone’s favorite pot stock, Tilray, is inching closer to $100 per share (ahem, versus a July IPO price of just $17). Apple is also up ~0.5% after yesterday’s 2.5% gain (it’s largest in five weeks) ahead of today’s iPhone event; see our big preview for more information on what’s expected. And your long-form read of the day comes from the WSJ, about the 29-year-old running the world’s largest crypto hedge fund: "Olaf Carlson-Wee Rode the Bitcoin Boom to Silicon Valley Riches. Can He Survive the Crash?" Tech stocks had their best day on Tuesday in almost two weeks (S5INFT +0.8%), a feat that’s even more impressive when you consider the appalling price action in the semiconductors. 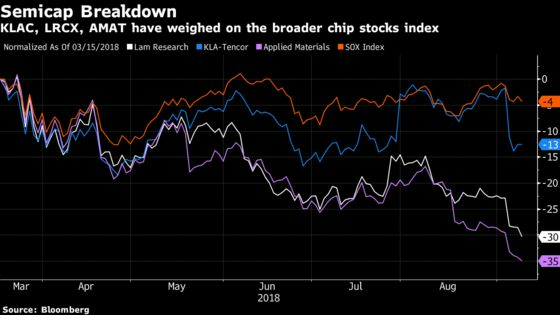 The SOX fell 1% for its fourth loss in five days as Intel continues to break lower, anything tied to memory took another spill, while the semicap equipment names continue to reel from KLA-Tencor’s warning shot from last week. The weakness is causing some analysts to capitulate on the space. For example, the big call that everyone will be talking about today is from Goldman, where they downgraded their semicap equipment coverage view to a neutral on reduced memory capex expectations (think KLA-Tencor, Lam Research, and Applied Materials), cut Micron to a neutral, lowered price targets on the memory names (Western Digital and Seagate), and removed Entegris from their conviction list. Separately, Stifel is slashing its rating on four semiconductor stocks in a note titled "Growing Signs of Potential Peak," citing tariff concerns, below-seasonal industry growth trends, and rising interest rates, which will place debt-heavy companies at greater risk. As a a result, the firm downgrades four chips with greater debt exposure and fewer secular catalysts, like NXP Semi (which fell >4% Tuesday after high expectations into its analyst day), Maxim Integrated, Macom Tech, and Power Integrations. While the rush into defensive sectors took a breather on Tuesday, the utilities, consumer staples, and telecom sectors still account for three of the four S&P sectors that are trading higher in the month of September. The rotation remains very much in play for now given the throng of uncertainties that are hanging over this market, most notably the $200 billion China tariff picture that’s getting murkier with each day that passes since the end of last Thursday’s public comment period. Joining the chorus of cautious prognosticators is Bridgewater’s Ray Dalio, who recommended getting "more defensive" in a CNBC interview yesterday ("If you look at projected returns relative to cash and bonds, the projected returns look sort of about right. The upside looks limited") and may riff on a similar theme when he comes on Bloomberg TV later this morning. 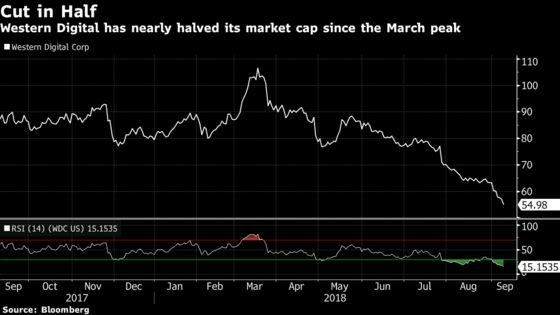 Two of the more prominent equity strategists that have also been striking a watchful tone as Dalio are Morgan Stanley’s Michael Wilson and RBC’s Lori Calvasina. The former has been pounding the table on his call pretty much on a weekly basis, specifically warning on the consumer discretionary names on Monday, while the latter took it to the next level in a note last night. Calvasina argues that the case for defensives continues to build. In turn, she put the utilities space on upgrade watch and lifted her view on the consumer staples to a market weight. She’s also recommending going underweight the new Communication Services sector (which will hold several FAANGs like Alphabet, Facebook, and Netflix) and the new Technology sector once the GICS reclassification goes into effect later this month. As mentioned above, the biggest calls that’ll be talked about today are in the semiconductors space i.e. Goldman throwing in the towel on the semicap equipment names and Stifel removing its buy rating on several chip stocks, including NXP Semi. 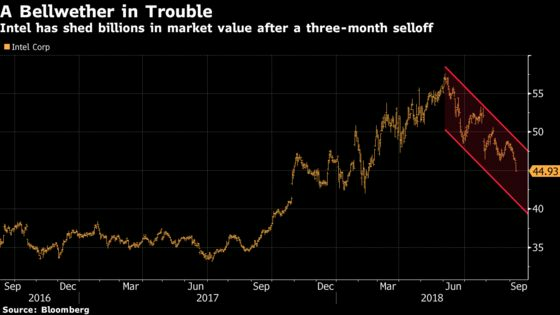 Separate from the semis, Goldman is also downgrading Acuity Brands to a sell after its recent outperformance, citing concerns around margin risk. BTIG moves Snap to a sell with a Street low $5 as the firm is "tired of watching Snapchat declines from the sidelines." Mizuho upgrades Worldpay (>10% hedge fund ownership) to a buy with a Street high price target of $125, citing synergies that appear conservative. B. Riley FBR upgrades Alcoa to a buy on elevated alumina prices, which should benefit the company’s near-term outlook and earnings power.